Mack Trucks Photo Booth app is a way to engage with customers in a fun way, and give users a personalised piece of merchandise to take home. 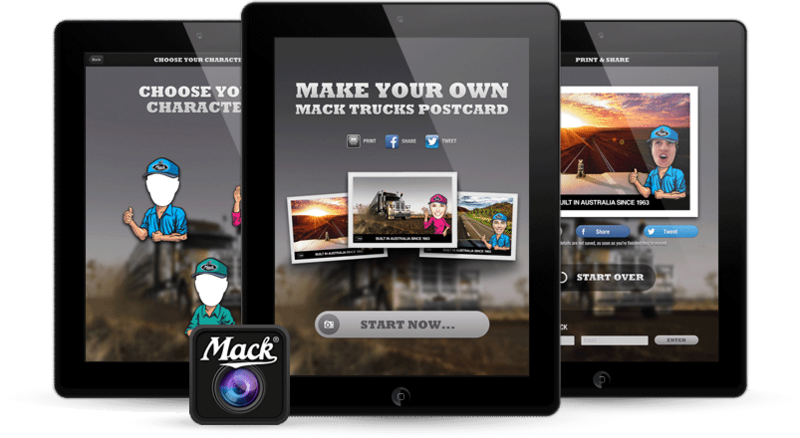 The app lets users take a photo of themselves, embed it into a postcard with Mack Trucks branding and imagery, and then print it out using AirPrint. You can also share via Facebook and Twitter using ShareKit. The app was used by thousands of people at the show. Mack Trucks approached us for their 50 Year Anniversary which was to be celebrated at the 2013 Brisbane Truck Show at the Brisbane Convention Center. It’s the 5th largest Truck Show in the world. We built another more formal application, but Mack Trucks also wanted something fun to reflect their fun and playful brand. As seen in the wireframe above, the planning phase focuses on functionality over visual appeal, but as you can see from the end result that doesn’t mean we’re not serious about visuals. The homepage has some bold text to grab attention, icons to show you can print and share, some example end result postcards, and a huge ‘Start Now” button with a camera icon to let people know what’s to come. The first step is to choose the postcard you want to use. We selected the three main trucks they were using at the show, and three awesome truck dashboard shots. Once your backdrop is selected you need to choose the character you want to use. We designed three different fun characters for Mack, a Man, Woman, and a more generic looking character. The next step is to take a photo of your face, and then pinch, scale, and move your face until it fits well in the character mask. The final result shows your face and the backdrop you chose in a personalised postcard! You can now Print, Share, and Tweet your photo. The Faceobok & Twitter sharing options utilise ShareKit, an open source tool for sharing to various social media networks. We customise the image, title, and text that is shared.